Hello and happy Wednesday! I can’t believe it’s been a week since I posted. I have decided that my revised posting goal is going to have a new post every Monday, Wednesday and Friday. And that will start today! Today’s project is a card we made in my Create A Cupcake Class I had a couple weekends ago. I love this set, so fun and easy to work with. It makes making birthday cards a piece of cake… no pun intended… hehe. I started this card by picking patterned paper I wanted to use then stamped the images to match. I had no real plan for the card when I started, I just let it become what it was going to become and I’m this is actually my favorite from the class. 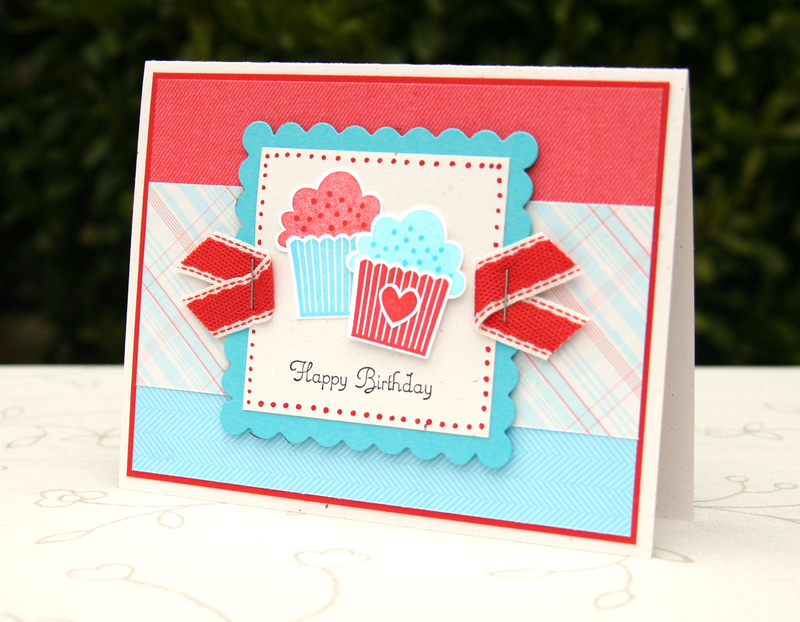 Check back on Friday to see another birthday card using Create a Cupcake. What a darling and fun card! Love your colors, design and textures! If I was giving out prizes…you’d win 1st place! So glad you shared Ü.
I like it too – appeals to the “easy” side of me. Love this card……..perfect for anyone having a b-day!